Did Astronauts Returning From the Moon Really Pass Through Customs? 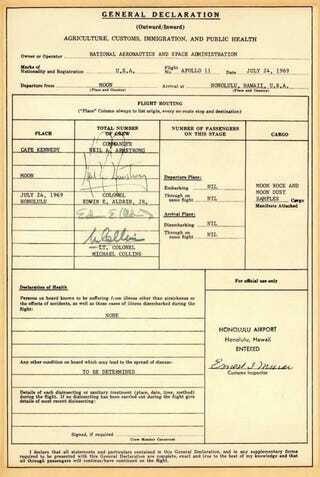 I love the Customs forms signed by the Apollo 11 astronauts on their return trip from the moon, but are they real? Yes, but not really. The form is a real form, but it wasn't filled out by the Apollo 11 astronauts when they transited Hawaii. Instead, it's more likely that the form was created by the Customs Director on the island, and submitted for signing by robotic pen at a later date. Did the Apollo 11 crew have to sign Customs declarations upon their return to Earth? Urban legend says yes; NASA and Customs and Border Protection (CBP) historians say no way. In a recent article in the Society for the History of the Federal Government's newsletter, The Federalist, NASA historians Steve Garber and Jennifer Ross-Nazzal and CBP Chief Historian David McKinney explore the myth, its origins, and the reasons why this anecdote persists in the public memory. The pictured form was not actually signed by the Apollo 11 crew after splashdown. It is most likely that it was created by the Customs Service's District Director for Hawaii, and the astronaut signatures were auto-penned onto it sometime later in the summer of 1969 at NASA Headquarters. I particularly appreciate that the International Space Station qualifies as no lodgings or meals requested. No one tell the bureaucrats about the espresso machine heading into orbit, or they'll make astronauts buy their own coffees.